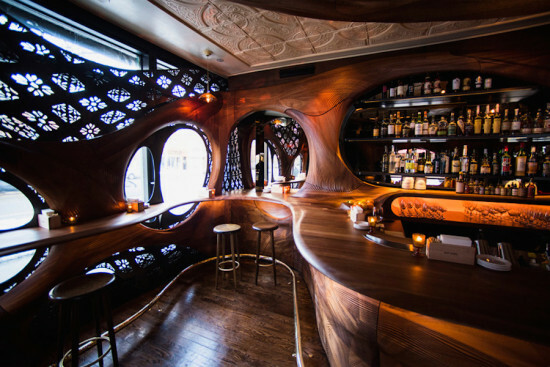 Sinewy muscle, tree stump joints, and Spanish art nouveau formed the inspiration for the enchanting new Bar Raval in Toronto, whose classy, tree house-like interior is awash with the gleam of sculpted mahogany. 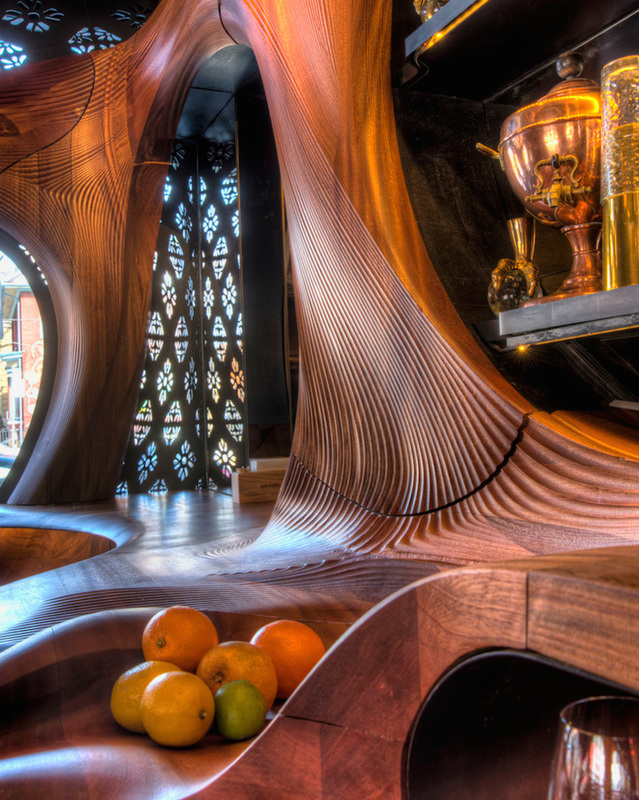 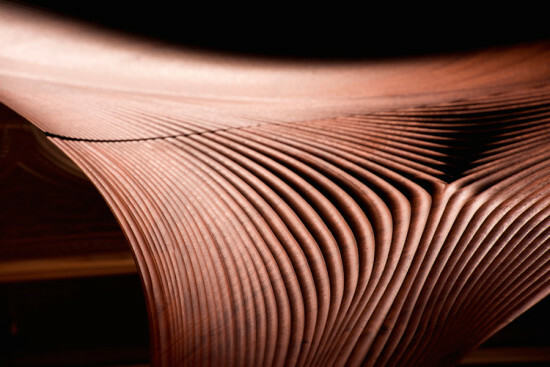 The wood has been shaped into voluminous curves and bulges patterned with sinewy lines all generated by computer code, and then oiled to a lustrous finish. 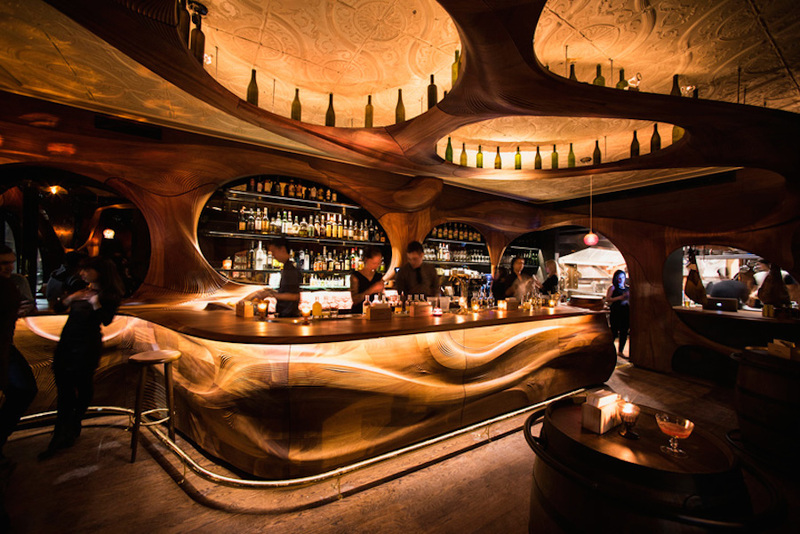 Nestled in the heart of the city’s Little Italy, the watering hole is designed to rival the art nouveau histories of Barcelona’s traditional pinchos bars, where stacked pieces of bread are served on skewers. Cutouts in the curvaceous wood frame delineate shelving and windows, the latter of which are shrouded by metallic lingerie to give passersby fleeting glimpses of the interior—perhaps the flicker of candlelight or the swish of a skirt. 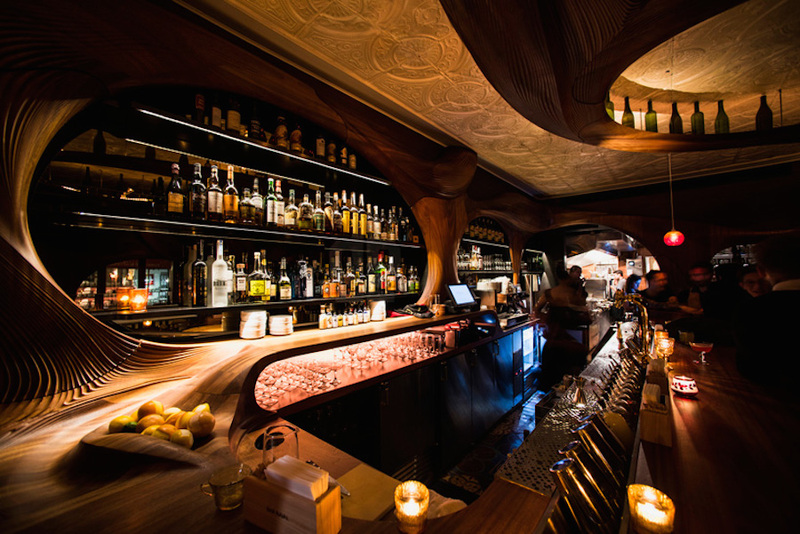 This air of enigma, Canadian studio Partisans maintains, is a metaphor for the mysteries of Toronto’s culinary and design worlds just waiting to be discovered. Overhead, a terraced protrusion bearing liquor bottles evokes the stump of an ancient hardwood tree, giving the impression that the bar is sunken beneath the ground and adding to the cosy, somewhat secretive atmosphere. 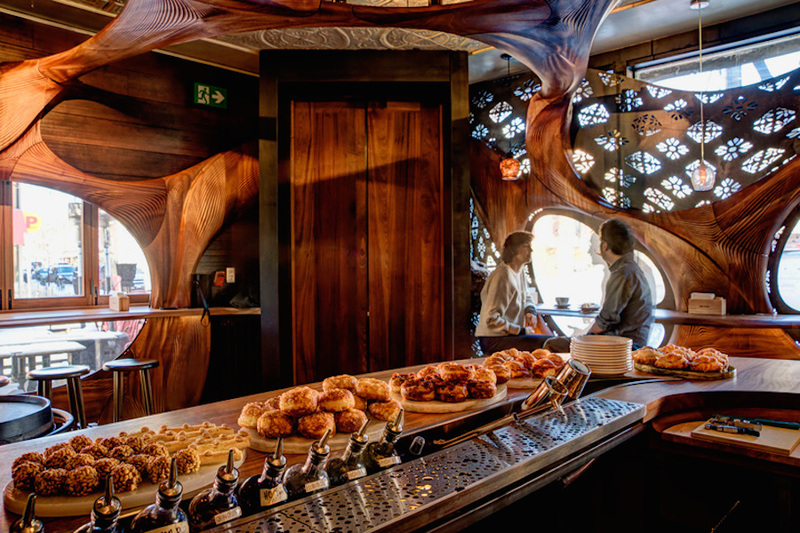 Accordingly, the bar is named after El Raval, a once seedy district in Barcelona. 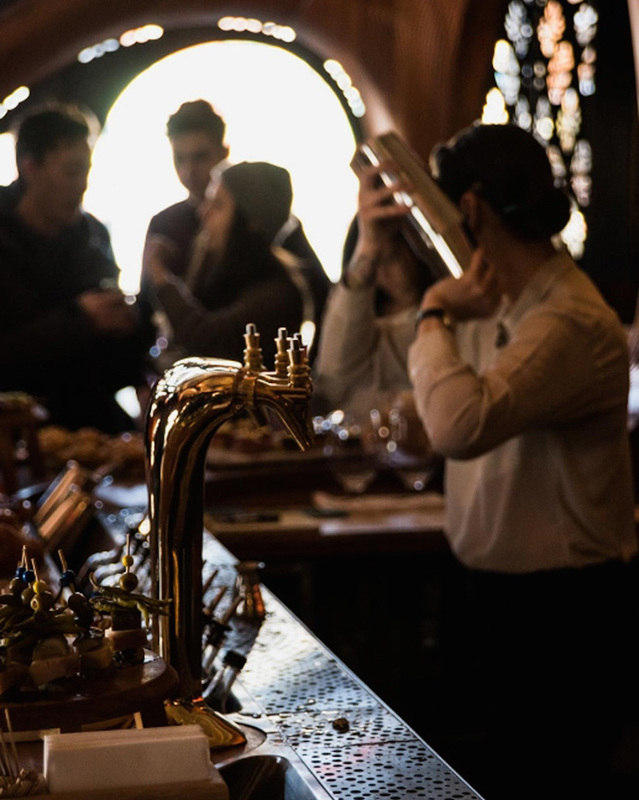 The watering hole belongs to Grant Van Grameren and business partner Mike Webster, one of the world’s most celebrated mixologists and masters of Spanish cuisine, art and culture. 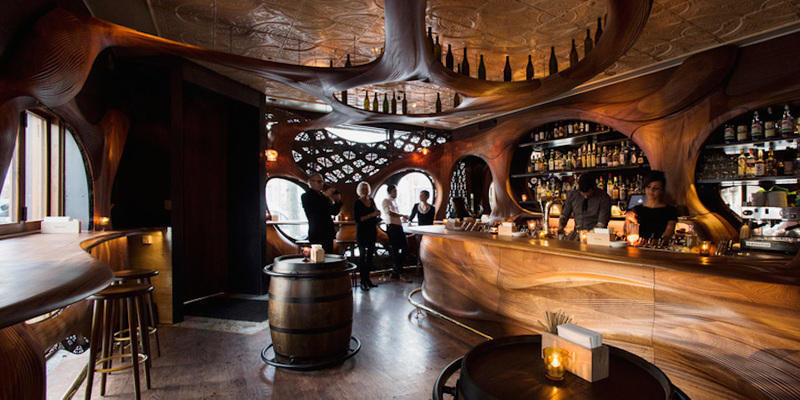 While brainstorming on the drawing board the team at the Canadian design studio clipped images of tattoos, muscles, and 19th-century building facades, all of which became integrated into the finished product.